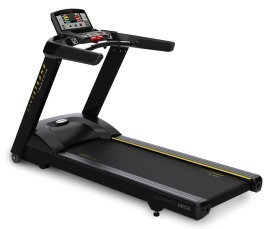 The new Livestrong T1Xe treadmill features an in-console TV screen; but otherwise, it is the same model as the T1X. The Livestrong T1Xe treadmill console has a 7" LCD window that shows workout feedback for time, distance, calories, pace, heart rate and incline. The window is also an integrated Vista Clear™ digital-ready television so you can watch any program during your workout. 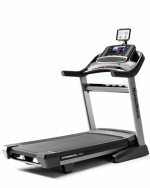 Unit Weight/Dimensions — 346 lbs; 84.6" x 34" x 52"
The Livestrong T1Xe treadmill has a Matrix 3.0 hp AC Dynamic Response drive system and motor controller that carries a 5-year light commercial and home warranty. The system is designed to run up to 6 hours per day for users weighing up to 350 pounds. The T1Xe has controller technology that monitors and adjusts to each footfall to provide a perfect stride at all speeds. It features a Habasit 2-ply commercial grade belt and an Ultimate™ hard-wax maintenance-free 1" deck that will last up to 25,000 miles of use. 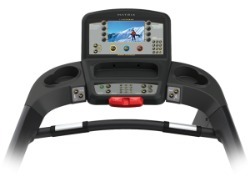 Along with the high quality 7" Vista Clear™ digital TV and easy-to-use console controls, you get six workouts including Manual, Rolling Hills, Fat Burn, Target Heart Rate, 5K race, and Gerkin Protocol. There are 11 languages available on the display, plus features such as one-button quick start, a pause function, and on-the-fly programming. Other features include a 20" x 60" running area, a max speed up to 12 mph, a low 7.5" deck step height, a 700-lb elevation motor that lifts the deck up to 15%, contact HR hand grips, and telemetric HR receiver. The Livestrong T1Xe costs $1000 more than the same T1X but includes the 7" LCD + TV screen instead of the LED display. That’s the only difference and a grand is too much to pay for a small TV screen when you likely already have a full size HD TV set up in your exercise room or family room. As such, even with free shipping and installation, the asking price of $6,195 makes this model the worst value in the company’s line-up. In reviewing the specs, the Livestrong T1Xe treadmill does not match up well to other light commercial models or even commercial treadmills. The 5-year drive motor warranty and 3-year parts warranty are a concern when you consider that other manufacturers offer 10-year warranties or better on their motors. In addition, with competitor treadmills you get more programs, better features, lift motors with up to 1000 pounds of thrust and much more. For $6000-plus, skip the Livestrong and go with a Precor, True, Life Fitness, or Cybex commercial treadmill.